February 2009 marks one year since my dog, Tucker, had a traditional repair surgery to fix a torn cranial cruciate ligament, or CCL. Overall I would say his progress has been fair, but certainly not without bumps in the road. 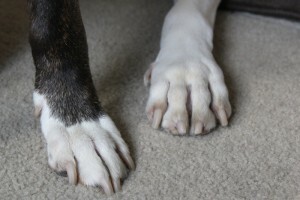 Since relocating to the east coast in October 2008, Tucker has begun limping more frequently at the end of the day, or following any type of exercise (it used to be only after long walks or extended play sessions with his canine companions). The affected leg changes – sometimes it is his surgical leg, and other times (although much less frequently) he will avoid using his good leg; there have been been a few instances where he would not use either of his back legs, instead choosing to drag himself around using his immense upper body strength. We have had him rechecked by a new veterinarian on the east coast who feels that this increase in weakness of the knee joints is due to the arthritic changes he is experiencing in his surgical leg. Since it is impossible for him to re-injure a leg where scar tissue has already been built up following surgery, the only other explanation for this would be arthritis (Lyme diease is also a cause for rear leg lameness, but this was ruled out in Tucker’s case). As for limping on the other leg, she feels this is probably some type of compensation injury – either a pulled/strained muscle – because of the way he is back to normal within 12-24 hours of limping. Her palpation of his good leg did not lead her to believe that there was the beginning of any tear, but we were advised to be vigilant and watch for any signs of an injury. Our only option at this point to control the symptoms he is experiencing as a result of arthritis would be to place him on a prescription anti-inflammatory, which we do not feel comfortable doing due to his age of 4.5. Our veterinarian also steered us away from an NSAID because of their risks, pointing out the fact that Tucker seems to be a very happy, healthy, comfortable dog in spite of his knee issues. Looking back on it, I think I would have chosen the same course of action if I had the chance to do it all over again. We gave CM a valiant attempt, and overall I am pleased with the way the surgery has turned out. Tucker, despite some limping issues every so often, is much better than he was pre-operatively, and I think the surgery had it’s intended effect of stabilizing the knee joint. Would I choose surgery if he tore the canine cruciate ligament ( CCL ) in his other knee? First, I would do Conservative Management for a period of months before having Tucker undergo another knee surgery. The recovery and surgical process was very hard for all of us physically, emotionally and financially, and we would really have to be failing miserably with CM to go ahead with another surgical repair. That being said, if after a period of a few months of strict CM we did not see any improvement, I would consider surgical repair; most likely the newer Tightrope CCL procedure. As I originally wrote, we stayed true to our commitment to first try Conservative Management. I’m happy to report that we were able to avoid surgery for Tucker’s second cruciate ligament injury.